Stepper motors are strong, slow and accurate. Their strength and relatively slow speed means they can usually be used without any gear-down mechanisms. Their extreme accuracy makes them ideal for robotic devices. They can be easily obtained from old computer equipment such as disk drives or printers. 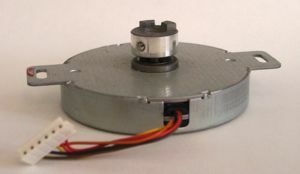 Stepper motors have unique running characteristics. Use the parallel port of a PC to drive stepper motors. Build a driver circuit that turns a stepper motor at a constant speed.